Honestly though, it's more of Le-I'm-bored-and-need-something-to-do-while-the-alpaca-washes post. But that's a long title. I got a surprise day off from work today, and spend the majority of it doing absolutely nothing. Didn't even bother calling my future college to check on something. Whoops. I can always do it tomorrow. Might make the husband take me up to the school to find some stuff out...after all, he's gotta be good for something. I'm doing far more spinning these days then knitting. Mostly because I have nothing of interest to knit while I'm at work and Thing 2 is napping. And I'm getting kind of tired of knitting fingerless gloves and socks; imagine that. The stole I'm testing for mom is interesting and keeps me entertained for a while, but because it's lace in every row, and there are 205 stitches (or something like that), it's not a project I can put down easily. But all the spinning is making me even better at what I'm doing. It's made me turn out things like the pictures below here. "Soot" was a "I wonder what it will look like if" kind of yarn. 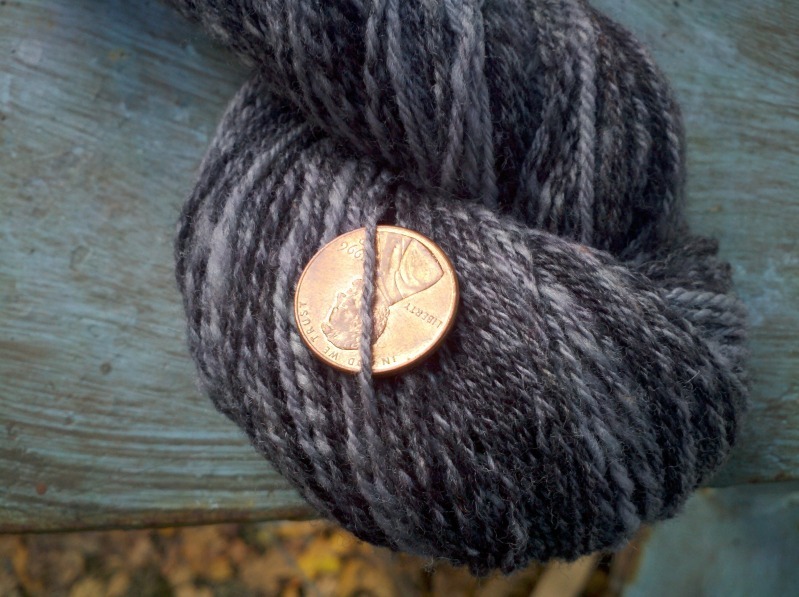 I held two chunks of roving together and drafted them out together. The beaded one was pretty much the same thing, with the added element of "how will it look with beads?". Mom liked it so much I'm making her her own skein; out of merino =D. There are a little over 950 beads in the yarn. No, I did not count, I used the tiny bit of math skills I actually picked up from the last class. Math...who'd have thought, right? 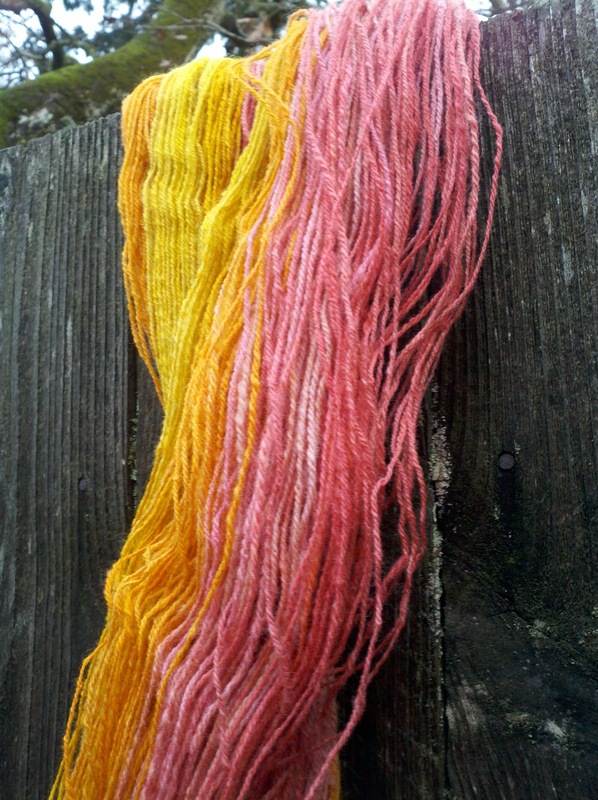 The pink/orange/yellow yarn is what was left of the Targhee/Silk blend I purchased. I wanted to play around with some of Mom's dyes, and that is what I got. It was also an attempt at making longer color sections in a yarn...I'm hoping it actually turned out that way. But since I won't be knitting it up, and have in fact put it into my Etsy shop *cough*shamelessadvertisment*cough*, I can only wonder and hope that it did what I wanted it to. I'm not sure what I'll work on next. I have enough roving from ParadiseFibers to keep me going for at least a little while. I might focus on knitting for a little bit too. Give Buggy a bit of a break...poor wheel. But I really wan to work on some of the alpaca fleece first. 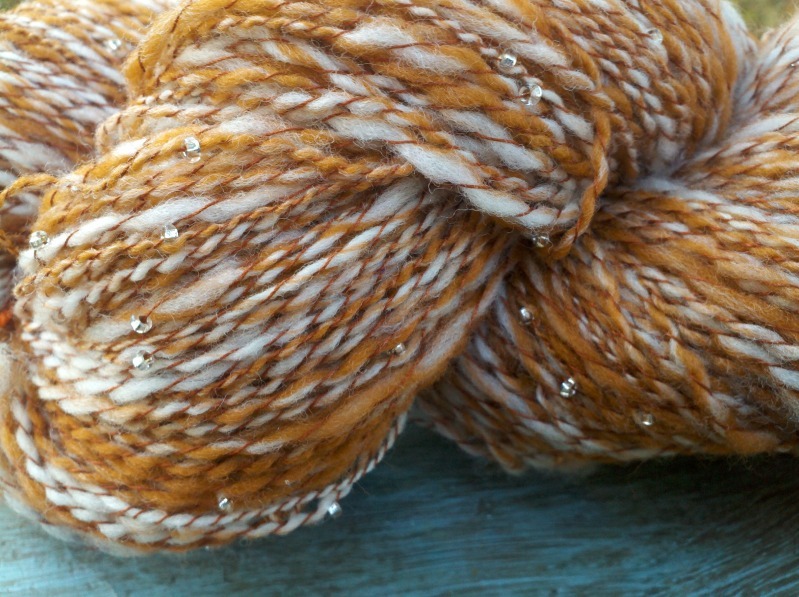 I've never spun alpaca before, so it should be interesting. Especially since it's still in lock form. =3 I also want to make the beaded yarn again in shades of blue with blue and clear beads. Maybe I'll flip a coin.